Which water purifier is good for health RO or UV??? SHOCKING ANSWER. Which water purifier is good for health RO or UV water purifier? If you have the same question then let me tell you first that both the water purifiers are not harmful for your health. There are many misconceptions that UV water purifiers are harmful to your health because it uses UV rays and UV rays can affect your body. Also there is another misconception that RO water purifiers are bad for health as it removes essential minerals from the water while purification. 1 First let’s talk about RO water purifier and misconceptions related to it. 1.1 So what is a TDS controller? 1.3 Why TDS controller or mineral enhancer is required in RO water purifier? 2 Now let’s talk about UV water purifier and misconceptions related to it. 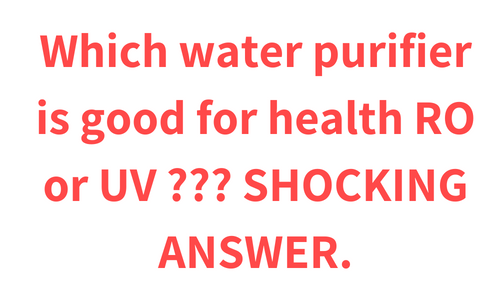 2.1 So is UV water purifier harmful to health or not? First let’s talk about RO water purifier and misconceptions related to it. There is a misconception that RO water purifiers are bad for health as it removes essential minerals from the water . And the thing is it is true upto certain extent. Because RO water purifier really removes essential minerals from the water like calcium and sodium. But water is not considered as the main source for such minerals. We can get such essential minerals from food. Also most of the RO water purifiers either comes with a TDS controller or mineral enhancer to retain such essential minerals. So what is a TDS controller? TDS controller as the name suggests, controls the TDS of the water. TDS stands for total dissolved solids. Total dissolved solid means the good minerals like calcium, magnesium, sodium etc and also harmful heavy metals like mercury, lead and arsenic. These minerals and sometimes harmful heavy metals could be present in water. TDS upto 500 mg / l is acceptable according to Bureau of Indian Standards (BIS). When the TDS of the water exceeds 500 mg/l then it is not considered as good for health and it falls under high TDS water. Consumption of such high TDS water can cause many problems like kidney stone etc. But at the same time if the TDS of the water is very low then it is also considered as unhealthy because then the water will not contain essential minerals like chlorine, sodium etc. So TDS controller helps to maintain the TDS of the water. Some water purifiers comes with mineral enhancer. Also as the essential minerals are added in the water, it enhances the taste of the water as well. Why TDS controller or mineral enhancer is required in RO water purifier? For the better understanding to the answer of this question we will first have to look at the working of RO water purifier. RO water purifier contains RO membrane which is the heart of this water purifier. The RO membrane is consists of tiny pores of 0.00001 Micron. Water is passed with great force through this RO membrane, which allows water molecules only to pass through it and blocks dissolved Salts and solids from the water. So as a RO membrane blocks all the dissolved Salts and solids from the water, it separates harmful heavy metals like mercury, lead and arsenic from the water and sometimes it may also separate the essential minerals like iron, sodium etc from the water. So to retain such essential minerals in the water TDS controller or mineral enhancer is required in the RO water purifier. So if RO water purifier has either TDS controller or mineral enhancer then such water purifiers are considered as good for health as it will retain essential minerals in the water. Now let’s talk about UV water purifier and misconceptions related to it. There is a misconception that the UV water purifier uses UV rays for the purification and UV rays brings an adverse effect on human body so the UV water purifiers are bad for health. This misconception is also true upto certain extent. So is UV water purifier harmful to health or not? Before we get the answer for this question first let’s have a look at the working of UV water purifier. In UV water purifier UV bulb plays very important role. UV bulb is the heart of the UV water purifier. It produces UV rays and the water is exposed to such UV rays which inactivates harmful bacteria, viruses and protozoans from the water making it 100% microbe-free. Now the UV rays can bring adverse effect on the human body but only when the human body gets in directly contact with the UV bulb. Alll the purification in the UV water purifier its takes place in the closed container so that our body will not get in contact with the UV rays of the UV bulb. That’s why UV water purifier cannot be considered as harmful for health. I hope that I have cleared all the misconceptions related to RO and UV water purifier and you now know that both water purifiers are good for health. If you have any questions let me know in the comments section below I will try my best to answer them all.